Oh I think you are really going to love this one. I spent last summer in Colorado and I was just absolutely addicted to the Panang Curry they served at this Thai place that was a block from my apartment. I went there way.too.much. Let’s just leave it at that. This is a veggie version of that amazing dish. I truly loved making it at home! Enjoy! Add the diced onion, diced carrot, and minced garlic to a skillet and cook over medium heat in in a little water until the veggies start to soften, about 5 minutes. Add additional water if needed to keep veggies from sticking to pan. Add the zucchini and red pepper and stir to combine, again, adding water if needed to prevent sticking. Add the tomato paste, curry powder, turmeric and salt. Stir to combine and cook for a few more minutes. Add the veggie broth and coconut milk and simmer lightly until the carrots are tender and it’s thick and creamy, about 15 minutes or so. Stir occasionally. Stir in the maple syrup, peanut butter, Sriracha, and cubed tofu and cook for a few more minutes until the peanut butter is mixed in and the tofu is heated through. Serve with brown rice or another grain of your choice. I don’t usually make soup that much in the summer. Soup is more of a winter thing for me and we get a loooooooot of winter in these parts! So by the time summer comes, I tend to eat a lot more simply…i.e. lots of finger food like bell pepper and hummus, sandwiches, fruit, popcorn, nuts, etc. I decided to make an exception because this just looked so yummy. And it was! I hope you enjoy this tasty plant-based recipe! Spray a medium-sized soup pot with olive oil spray. Add onion and garlic and sauté for 3-4 minutes. Add a little water to keep the onion and garlic from sticking to the pan if needed. Add potato, season with a little salt and pepper, and cover the pot with a lid for about 5 minutes. Add 1.5 cans of corn, reserving 1/2 a can for garnish, and stir. Add broth and almond milk, cover, and bring to a low boil. Reduce heat to low. Cook about 5 minutes, or until the potatoes are soft and easily pierced with a fork. Use a hand blender to blend the soup to desired consistency. I like mine a little chunky but still with some creaminess to it. Do whatever you like! If using nutritional yeast, add now. For plant-based cooking, nutritional yeast gives dishes a bit of a cheesy flavor. To be honest, I haven’t been able to find nutritional yeast in Moscow, but I had some my mom had sent me in a package from Trader Joe’s, so I used it. It will still be tasty without it! Mix 2 TBS. cornstarch with a little water to make a thin paste and add this to the soup. (It’s called a slurry and it will help thicken that chowder right up!) Simmer at least 10 minutes to let thicken. The longer it simmers, the more flavorful it will be. Do you have any idea how much sugar is in most store-bought cereals and granolas? I didn’t really think about it. Muesli and granola – that’s healthy, right? Well it can often have the appearance of being healthy while being a sugar bomb for your breakfast bowl! Here is a yummy recipe for WFPB granola. I ate mine with some plain soy yogurt and blueberries. So yummy! If you aren’t doing the plant based “thang” you can still enjoy this with some plain regular or greek yogurt and your favorite fruit. Beware of flavored yogurts though…lots of sugar in there usually! Add the oats to a large bowl and set aside. Line two large baking sheets with parchment paper. Place the dates in a medium saucepan with 1 cup of water and bring to a boil. Cook over medium-low heat for 10 minutes. Add a little more water if needed to keep the dates from sticking to the pan. Remove from the heat and add the mixture to a blender or food processor with the bananas, extract, and salt. Blend until smooth and creamy. Add the date mixture to the bowl with the oats and mix well. Divide the granola between the two prepared baking sheets and spread out evenly. Bake for 50 minutes, stirring every 10 minutes, until the granola is crispy. At 50 minutes mine still wasn’t quite crispy, so I turned the oven up to 350°F and baked it for a little longer. Just whipped up this soup this morning before I headed off to the university. Took less than an hour to make, and SUPER yum! 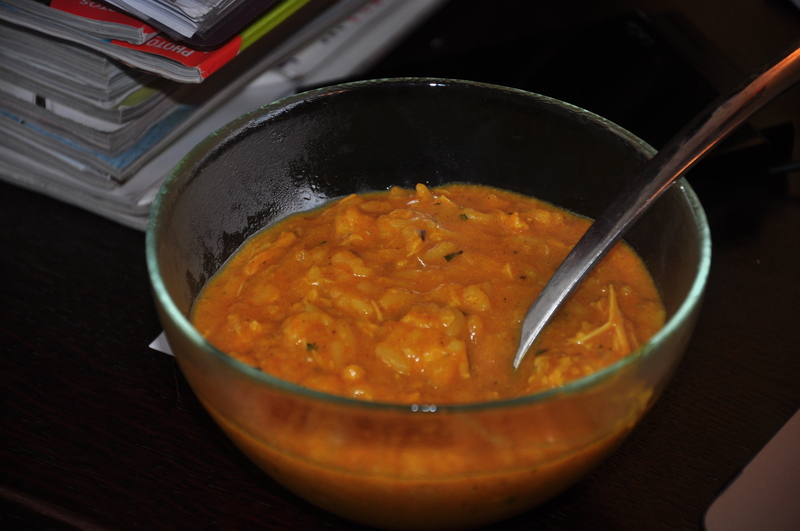 I know some people only like pumpkin in dessert type things, but I am just LOVING this soup. Hope you’ll try it! -Saute 1 chopped onion in olive oil spray. Add water to the pan to keep the onion from sticking if needed. -Take the pan off the burner to make a white sauce. Blend in 2 Tbs of flour and 1/2 tsp salt into the sauteed onion mixture. Slowly add 2 cups of coconut or almond milk, constantly stirring to prevent lumps from forming. Return to heat and stir until the sauce bubbles and thickens. Tomato Soup – Quick and Speedy and Easy and Yummy! Yummmm. Normally this is not something I would make in the summertime – especially when its been so hot in Moscow! But a few weeks ago, when it WASN’T as hot, I made the Cheese Muffins that I love for my roomie who was coming home from a trip in another city. 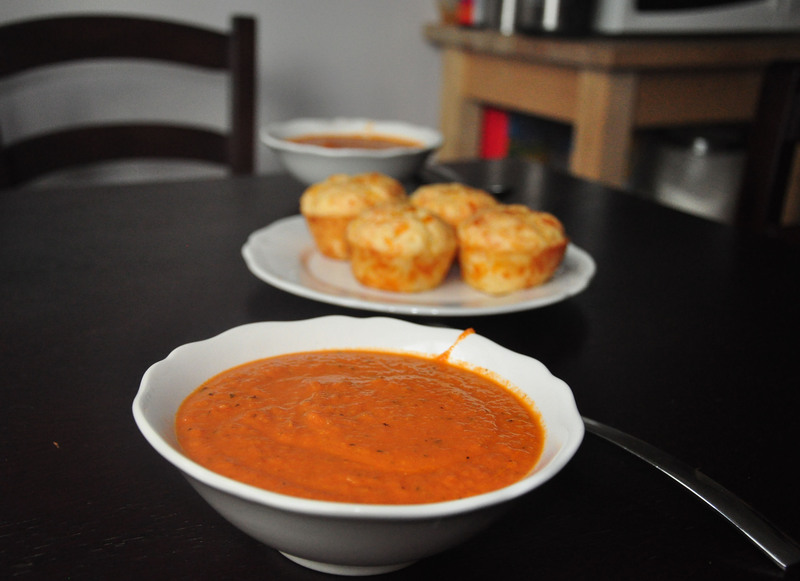 They were perfectly paired with this quick and easy to make tomato soup. Put all ingredients into a blender or food processor and blend until smooth, about 20-30 seconds. You can blend it for a shorter amount of time if you like yours a little chunky. Transfer mixture to a medium-large saucepan and heat over a medium heat, stirring until hot. Mix 2 TBS. cornstarch with a little water to make a thin paste and add to the hot soup. Simmer until soup thickens a bit. Enjoy!